WE174 Features: -Chin dip combo. -Two athletes can train simultaneously. -Chinning station has steel lat bar for various grip widths. -Ships unassembled via freight carrier. -Made in USA. -Dip station grips constructed of 1.63" round tubing spaced 19" apart and 55" from floor. 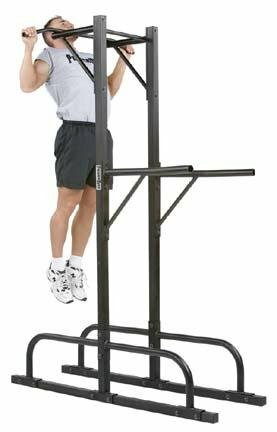 Product Type: -Chin-Up Bars. Hand Grips: -Yes. Weight: -50 lb +. Country of Manufacture: -United States. Dimensions: Overall Height - Top to Bottom: -88". Overall Width - Side to Side: -42". Overall Depth - Front to Back: -61". Overall Product Weight: -140 lbs.